Newscoop content is organized in a hierarchical structure, which conforms to the tradition of newspapers and magazines: Publications, Issues, Sections and Articles. Each publication is made up of issues; each issue is in turn made up of sections, which are comprised of articles. A 'breadcrumb trail' of links is present on every page of the administration interface, just beneath the main navigation menu, which enables quick navigation between different levels of the publishing hierarchy. This hierarchy is also shown at the lower end of the Content menu, if any publications have been created. 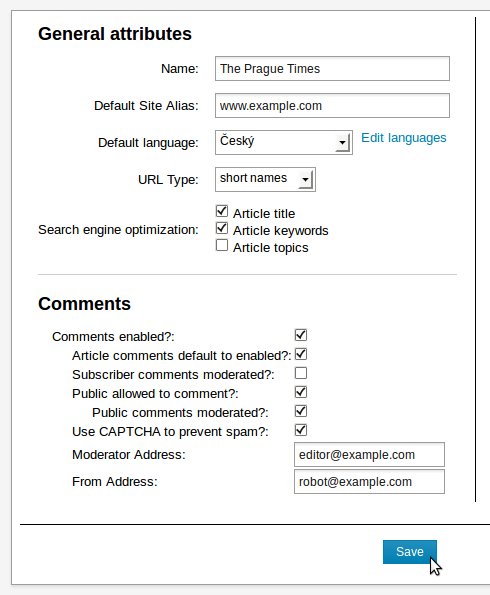 For example, by clicking on a publication named the "The Prague Times", you can see the list of issues for that newspaper. By clicking the name or number of a particular issue, you enter its list of sections. By clicking the name of a section you enter the article list. By clicking the article title in that list, you can edit the article. Your system administrator may have already created a publication for you. To create a new publication, click Content on the main navigation menu, and then click Publications from the sub-menu. On the Publication List page that appears, click Add new publication. If your login account does not have administrator rights, you will not be able to see the Add new publication option. You may need to ask your system administrator to enhance your access rights. Bear in mind, however, that a good administrator would be reluctant to hand over those rights to more than a handful of people. If you are not among those select few, your Publications List will only contain the publications already hosted on your Newscoop server. The Add new publication window has three sections; General attributes and Comments on the left, and Subscription defaults on the right. There's a Save button beneath these sections. Article comments default to enabled? If you check this box, then article comments for any new article will default to "enabled"
After clicking the Save button, Newscoop will confirm that the new publication has been created. 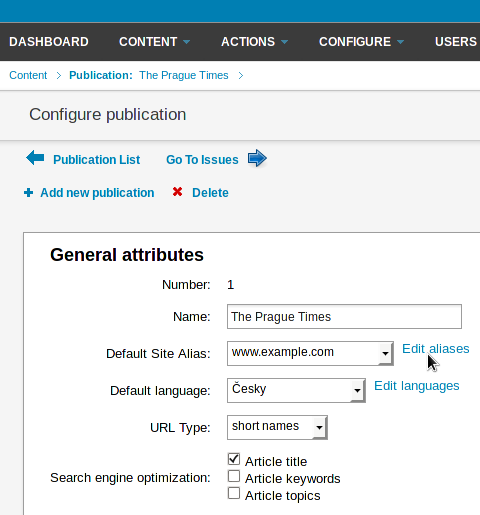 You can return to the publication configuration page at any time by clicking the Configure icon in the Publication List. Newscoop enables multiple publications to be hosted on the same physical web server, providing that a unique alias has been set up for each publication by your system administrator. It is also possible for a single publication to be reached via multiple domain name aliases, which can be set up after the publication has been created. 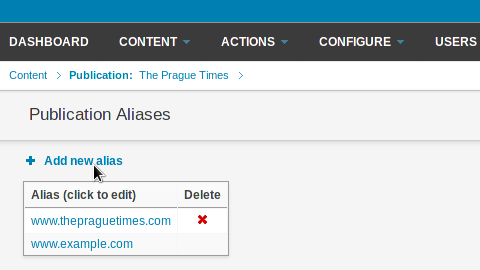 To the right of the Default Site Alias field, an existing publication will have the link Edit Aliases. Click this link to open the Publication Aliases page. Then click Add new alias to add as many aliases as you wish. Aliases other than the default can be deleted by clicking the red x icon in the right side of the table. These aliases must have valid DNS and web server virtual host entries set up by your Newscoop system administrator in order to function correctly. See the chapter Manual installation for an example of Apache web server virtual host configuration. The fields on the right side of the publication configuration page are related to subscriptions, which you can adjust later if you wish. 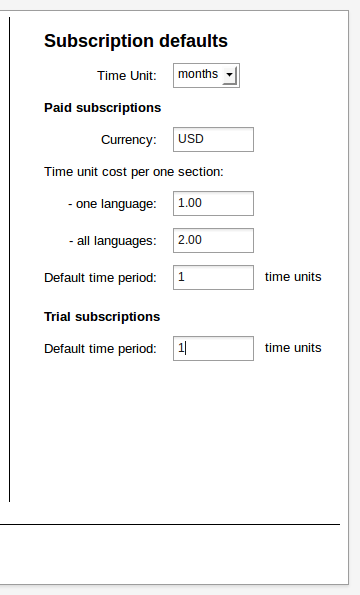 First, you have to select a time unit for your subscriptions; which could be days, months, weeks or years. 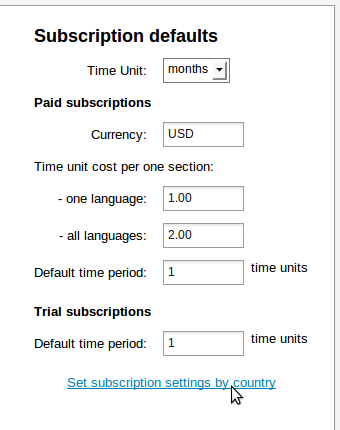 On the right hand side under the Subscription defaults fields, there will now be a link Set subscription settings by country which will enable you to specify different default time periods for individual countries. 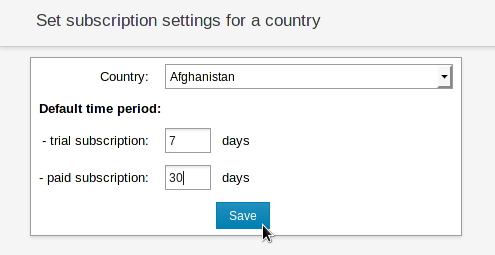 This link opens the Subscription Settings by Country page, which has a link Set subscription settings for a country. If you follow this link, it opens a page with a drop-down menu for selecting the country in question, plus fields for the default trial and paid subscription lengths. Clicking the Save button returns you to the Subscription Settings by Country page, which should now show the setting you have just made.